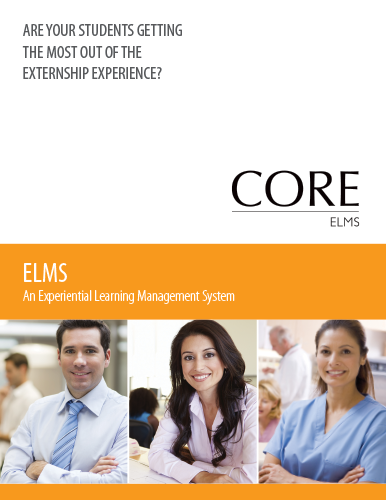 CORE ELMS | Externship Management, Field Scheduling, Site Management and More. CORE ELMS is experiential learning management software supporting clinical and experiential education departments in the management of student externships, clerkships, clinicals, and field work. 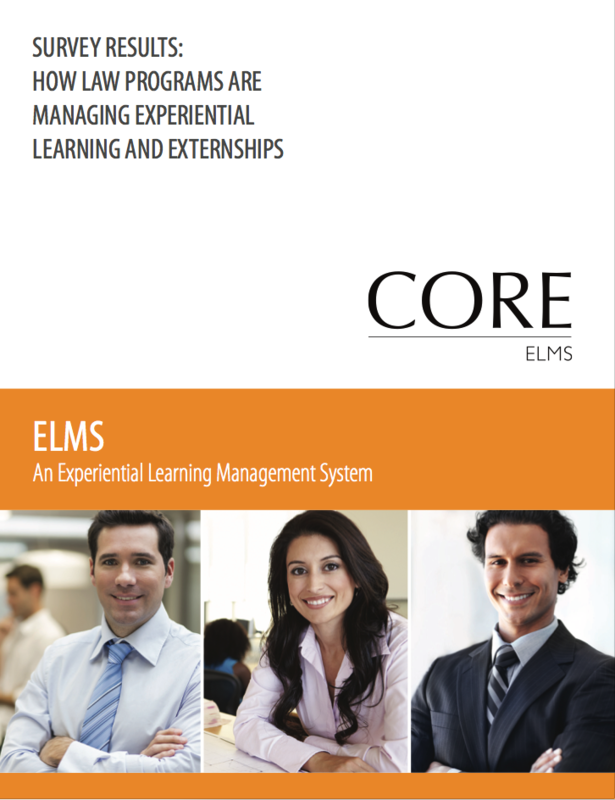 Manage ELMS administrators and define access levels. Manage student accounts and student profiles. Manage Preceptor / Placement accounts and profiles. Allows users to submit potential user account information for approval. Manage student scheduling (smart-matching or manual hand-slotting). Create student schedules without adding site availability. Electronic submission and collection of site schedules and availabilities. Allow students to research and submit non-affiliated sites for approval. 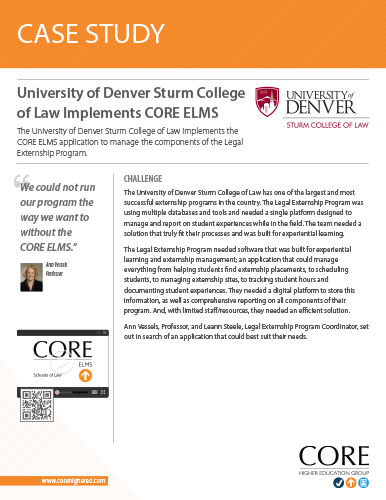 Create and manage custom student evaluations. 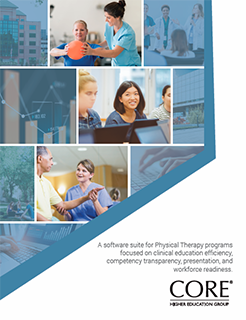 Create and manage custom Preceptor & Placement evaluations. Create and manage custom student self-evaluations. Manage student requirements (background checks, immunizations, etc) and site affiliation contracts. Logging, tracking, GPS location, and reporting of student hours in the field. Track and report on specific student field experiences. Create, manage, and collect custom surveys and forms. Manage and track student absences in the field. Record reported incidents that occur while students are in the field. Communication portal for mass-emailing all user groups. Upload and share documents and files with all user groups. Track communications with individual users including site visit history. Add custom/supporting buttons with links into the left-hand navigation bar. Help center to support all user groups. 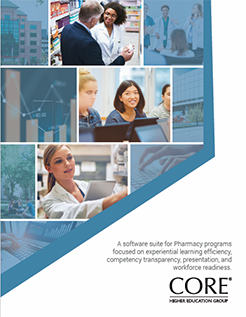 Track payments to Mentors/Preceptors and generate check requisitions. 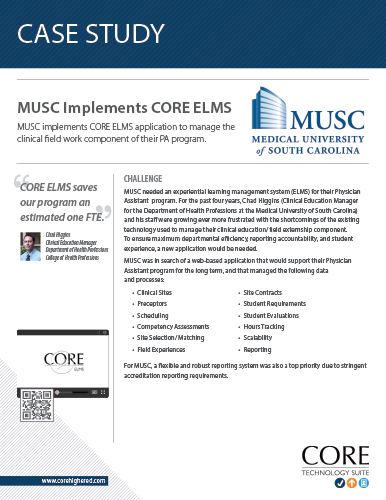 Present the various "benefits" offered to your field mentors/preceptors. Allow Mentors to run reports in a limited capacity. Submission and collection of "Mentor of the Year" nominations. Present continuing education activities to users (integrated with CE Search Engine). Track student start dates through their last date of attendance. Full functionality job board connecting employers with students. Track graduate employment placements and send employment verification surveys. Integrate with the CompMS student competency assessment portfolios. Integrate with the MyCred self-curated presentation ePortfolios. Switching to CORE was an easy decision. CORE just had the best value, exactly what we were looking for in terms of support, and so it was an easy decision for us to make. 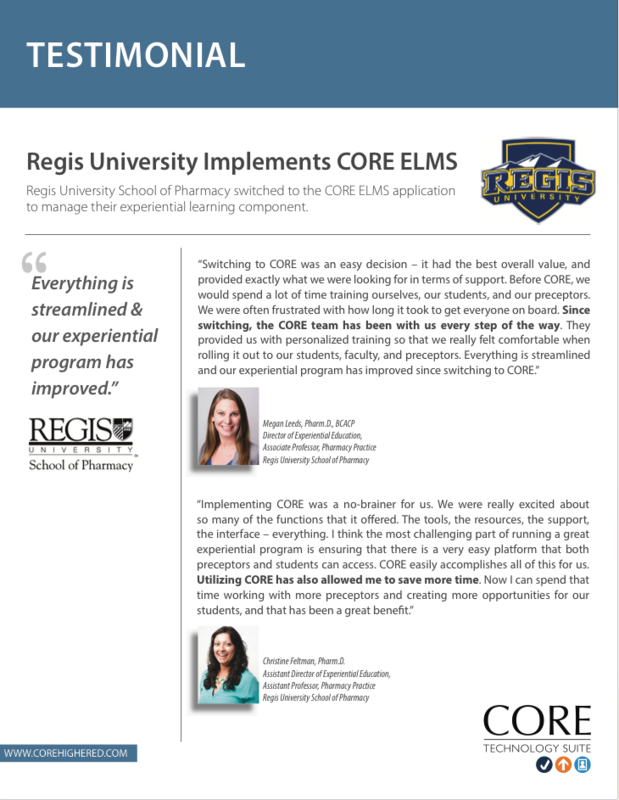 The CORE team has been with us every step of the way, providing trainings for us so that we really felt comfortable once we were rolling it out to our students, faculty, and preceptors. We really needed to have one system that met our needs. 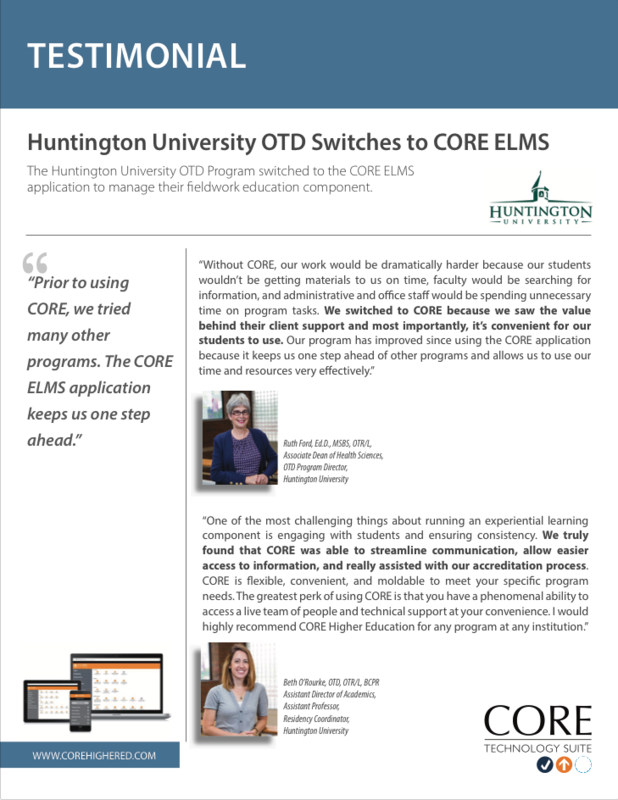 We purchased CORE because we saw the value of having the technological support, but more importantly it's very convenient for our students to actually use CORE and the way it's integrated together. 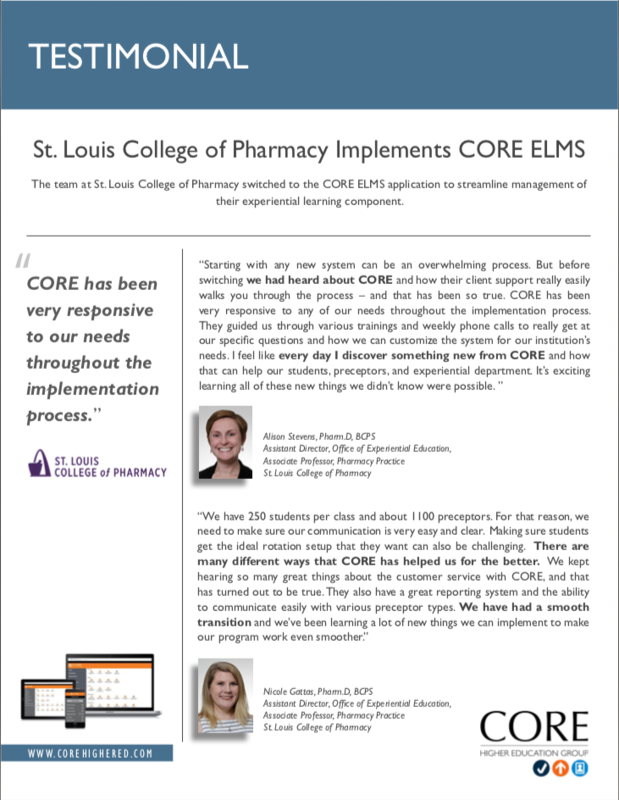 CORE has helped streamline and make our processes so much more efficient. We're able to do things within one single system instead of jumping from system to system, we're able to more easily communicate and we're taking a lot of the duplication out of our day-to-day processes. 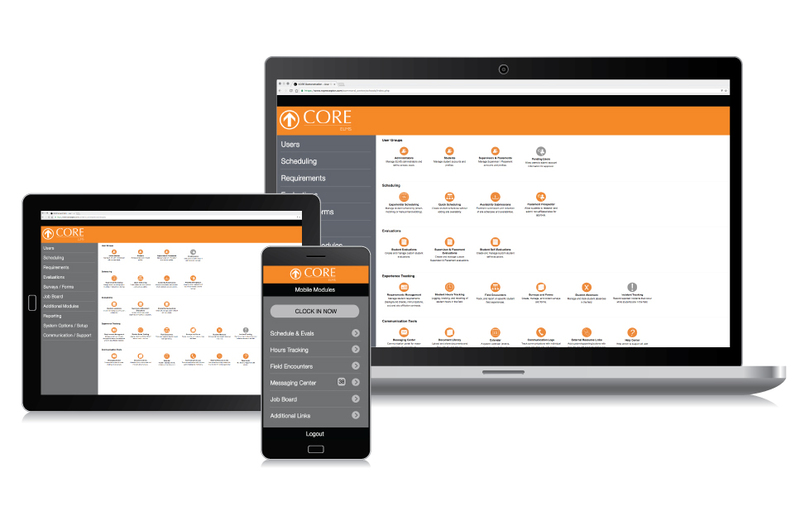 It has been a seamless transition for us, it's been fantastic to be able to work with the development team and our client services representatives with CORE to customize the things that we need to accomplish. Dr. Erin Johanson, B.S., M.Ed., Ed.D. 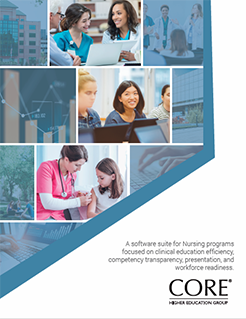 We found that CORE was able to streamline communication, allow easier access to information, and assisted with our accreditation process. 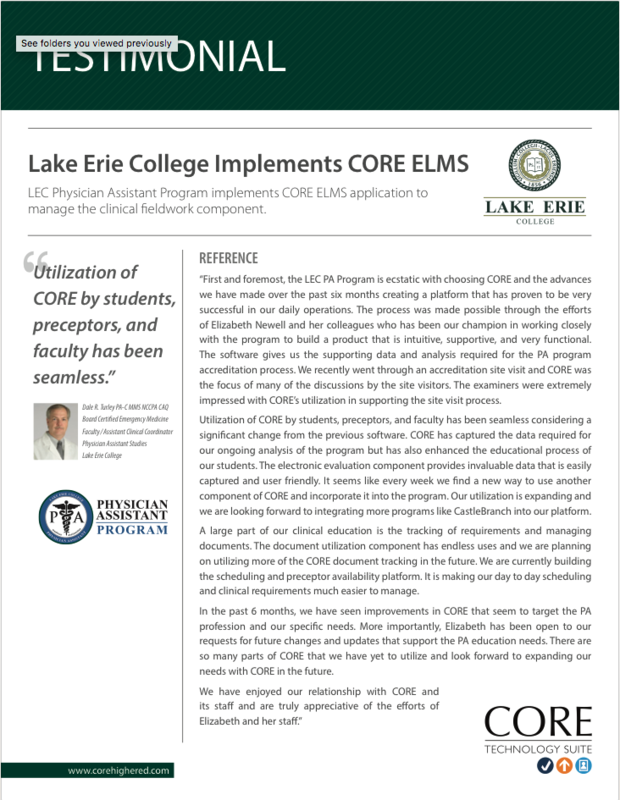 I would highly recommend CORE Higher Education for any other educational program that you may have at an institution, Undergraduate or Graduate. 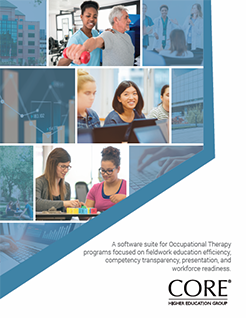 CORE has really helped us become more organized, more structured, our program was kind of a mish-mash of various spreadsheets and tables and graphs, and CORE enabled us to put it all into one place. The site requirements, the forms, scheduling, the ability to design our own schedules, our own evaluations, design the rotation dates, rotation types, and when we change our curriculum, it's very adaptable and enables us to change instantaneously. We can update our curriculum at any time. One of the most difficult parts of finding a new database for our Physician Assistant program was we needed our preceptors to show where they have their admitting sites. 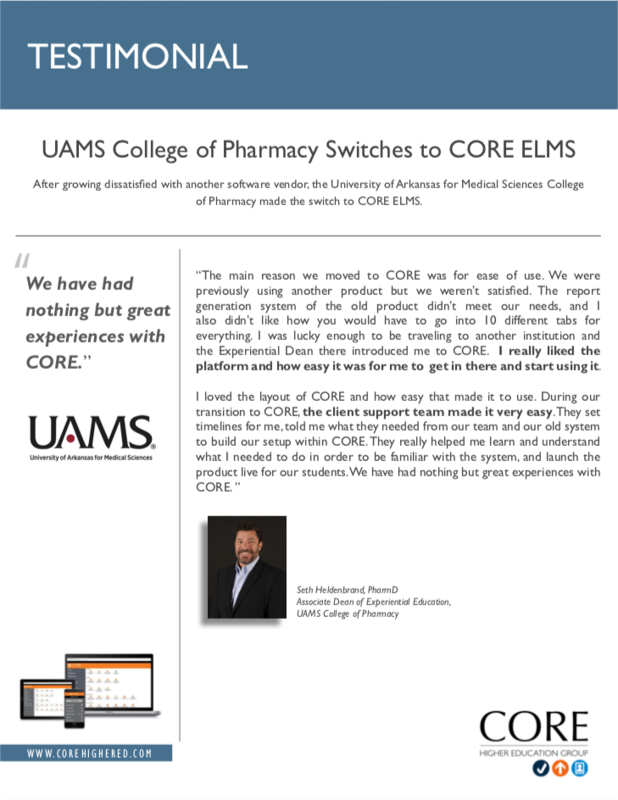 It took us about a year to find CORE and CORE has been the only system that has been able to do it. One of the things we've loved about working with CORE in the past year and a half is the customization, both from CORE development team and on our side of things. 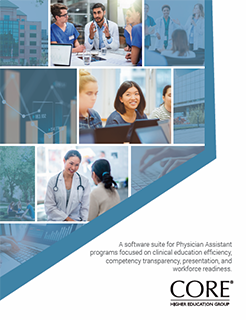 So, any time we've asked for things with Requirements, or with Evaluations, CORE development has created a baseline to which then we can customize exactly what we want from our preceptors and our students, to get everything that we want out of Evaluations and preceptor development.